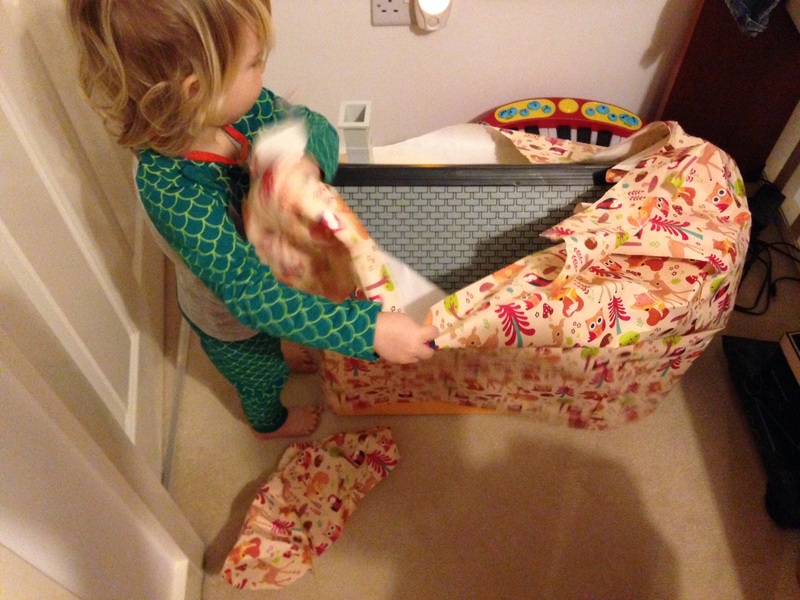 commonsensemum – How hard can it be? I used to love sensory boxes. I’d make them up for Squeak while Quibble was at school and she would happily play with them alone and then share them with Quibble when he came home. I bought cheap shaving foam, small animal figures and all sorts of pulses, I dyed rice and collected little pots or any other junk that could be useful in exploring the different textures and I was generally very enthusiastic about the whole thing. I don’t remember when, or why. We just didn’t do them for a while and in that time Squeak grew up. Now she’s three (and loves to remind me she will be four on her next birthday), she seems too old to be interested in a toddler activity. And if she isn’t interested, then Squeak (with his constant requests for Pokemon cards or iPad games) certainly isn’t. And now I am left with all the stuff taking up space in our not-big-enough utility cupboard. I didn’t manage to take a ‘before’ photo, but I snapped these just as they started playing. 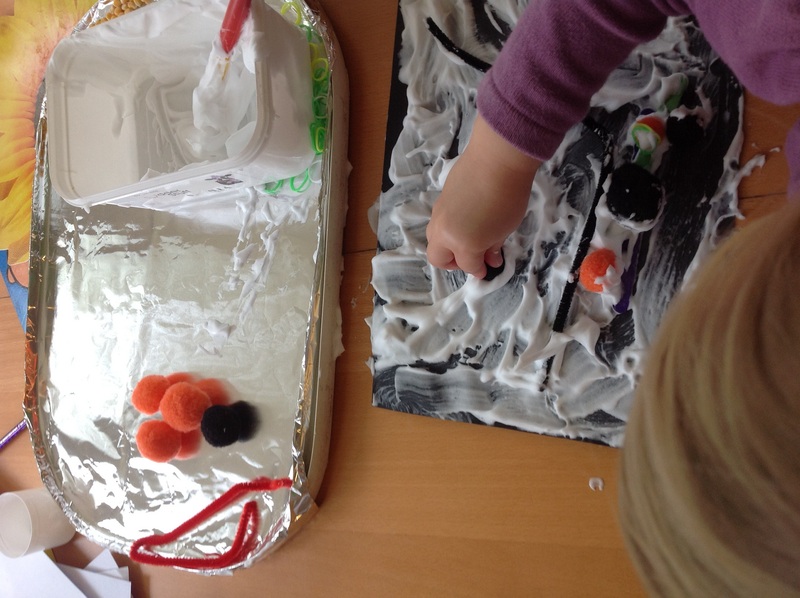 Each tray has been covered with foil and has on it an ice cream tub with some shaving foam in, pom poms, lolly sticks, popcorn kernels, loom bands, pipe cleaners, paintbrush, plastic spoon, chopstick and a sheet of black paper. (Honestly, this was more than they needed.) It was loosely Halloween themed with the colours I chose – red, black, orange and green – but neither child seemed to do Halloween themed play, so perhaps this was more for my benefit than theirs! 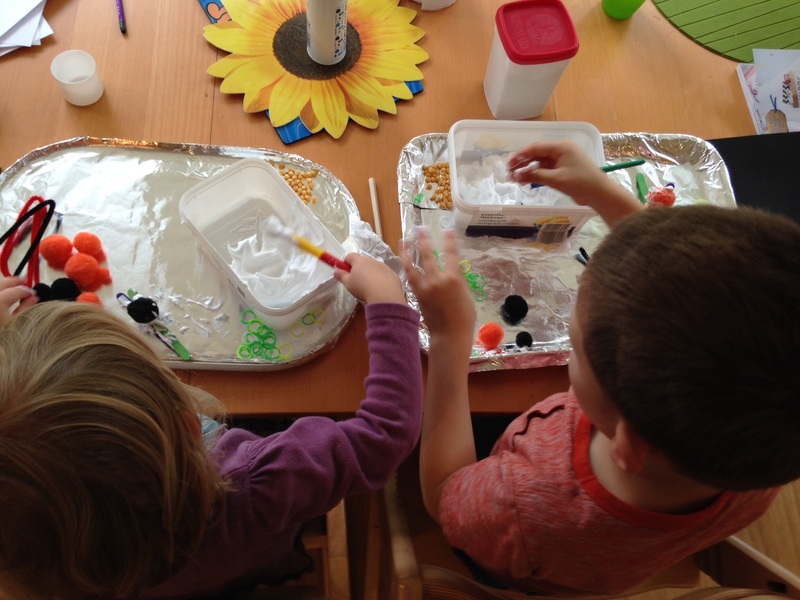 They used the shaving foam as glue, paint and ice cream. 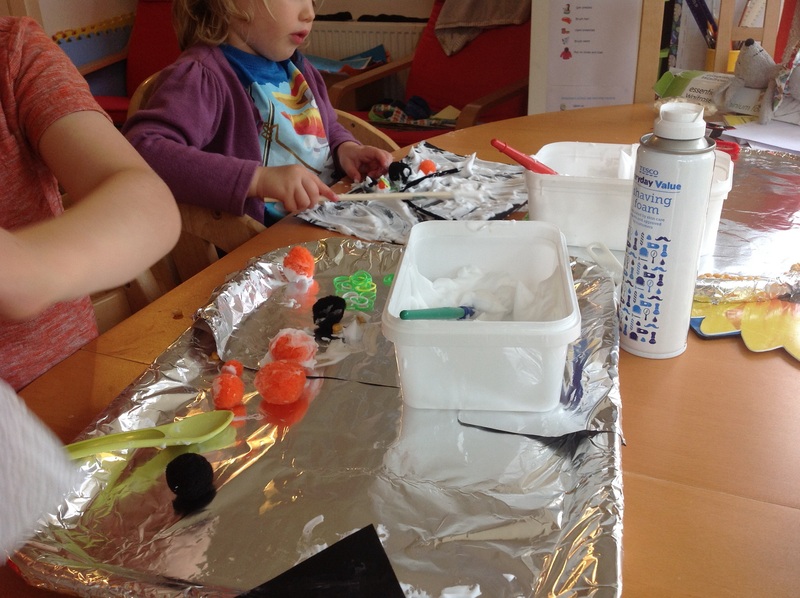 They made things and decorated things and wrote things on the silver foil. It kept them entertained for nearly an hour and I can see that the same simple set up (tray, tub with a sensory base and some bits) will work again and again. I’m thinking of using ice and glitter as a ‘Frozen’ theme, lentils and animal figures for a ‘farm’ theme, play dough and cupcake cases for a ‘baking’ theme. In fact, just unrelated stuff put together because Quibble and Squeak will find a way to put them together. These are definitely the new sensory box! I’m not sure if I’m allowed to say I love my children more when they’re quiet, but I’m certainly a happier Mum when my kids behave well. A friend recently confided that she was dreading her cousin’s wedding and when I offered to pass her a bag of tricks to help entertain the kids she jumped at the chance. 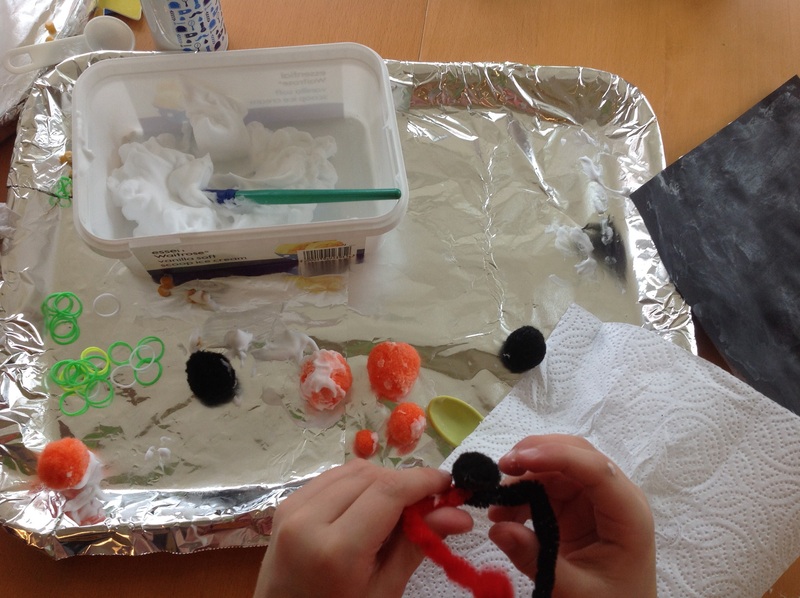 ‘But where did you get these ideas from?’ she asked and I had to admit that every idea was stolen from other parents – either in real life or via their blogs. Lots of the suggestions that I came across were a bit ambitious for me – I’m always short on time and rarely have a laminator to hand, so I thought I would share some of my more realistic suggestions for ways to keep kids happy even when they can’t run around. Cards – At 6, Quibble is old enough for Top Trumps or snap cards, but even Squeak enjoys looking through a set of cards sorting, organising and making up her own games with them (the only consistent rule seems to be that she has to win). Colouring – Quibble has just discovered colouring-by-numbers books, while Squeak is often happier with just plain sheets of paper. Often, for a specific occasion, I try to print off some pictures from the internet to colour – the novelty of images they haven’t seen before keeps their interest. Stickers – I’ve never met a child who didn’t like stickers. They don’t last long – my two seem to want to get all the stickers stuck on a sheet of paper or into a notebook as quickly as possible – but it is an instant distraction when they need settling down. Wallets – I bought a couple of cheap wallets at a charity shop (and have since acquired more from gift shops and freebies from magazines) and filled them with unwanted business cards, a couple of small photographs, fake money and credit cards. I thought the novelty would wear off pretty quickly, but these have lasted over a year now. Beads – I have a small tin with beads, blutac, a shoelace and some little wooden sticks. This is more popular with Squeak than Quibble, but both have enjoyed threading the beads. 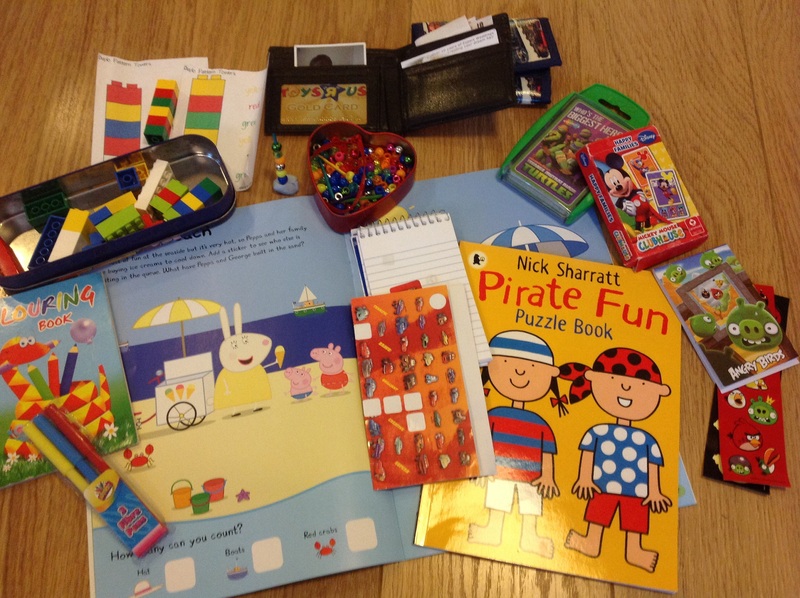 Activity books – Puzzles, dot-to-dot, spot the difference, mazes, wordsearch more colouring and stickers. Ideally, smaller than A4 (so they fit on a table) these can be picked up at pound shops, supermarkets or charity shops in advance and hidden until needed. Lego – A small bag or tin of Lego with or without instructions (such as these) Squeak mainly builds towers and Quibble usually makes spaceships but both do it sat quietly at the table. Next time I’ve got ideas to stop boredom meltdowns for those times you’re just hanging around waiting. Pinterest is my mother-so-secret obsession. I’ve had to delete the app from my phone to stop myself from scrolling through the endless images created by people with far more skills than I when I actually have a million other things to be doing. I know I’ll never be able to entirely recreate the images on these board, but I still like to think that pinning them makes me a step closer. I’m aware that other mothers feel guilt, but I like to keep mine secret. I love my kids and I do the best for them and logically that should be enough. I should not feel guilty and so when I do, because of course I do, I don’t tell anyone. When my friends admit that guilt has stopped them from leaving before bedtime or going on a spa weekend or taking on an extra day at work, I feel slightly smug that I don’t have such problems. 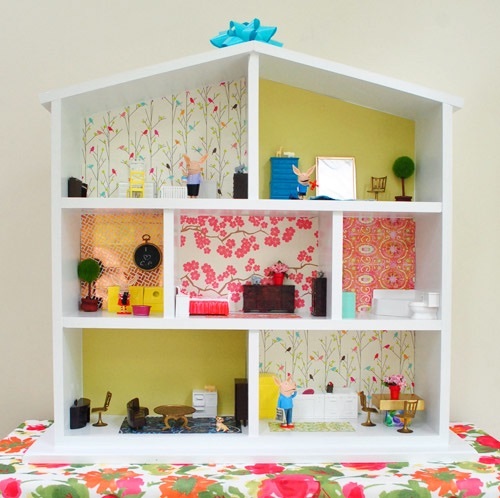 These two things may seem unrelated, but when I came across a this image of a dolls house, I was surprised by the ferocity with which they collided. 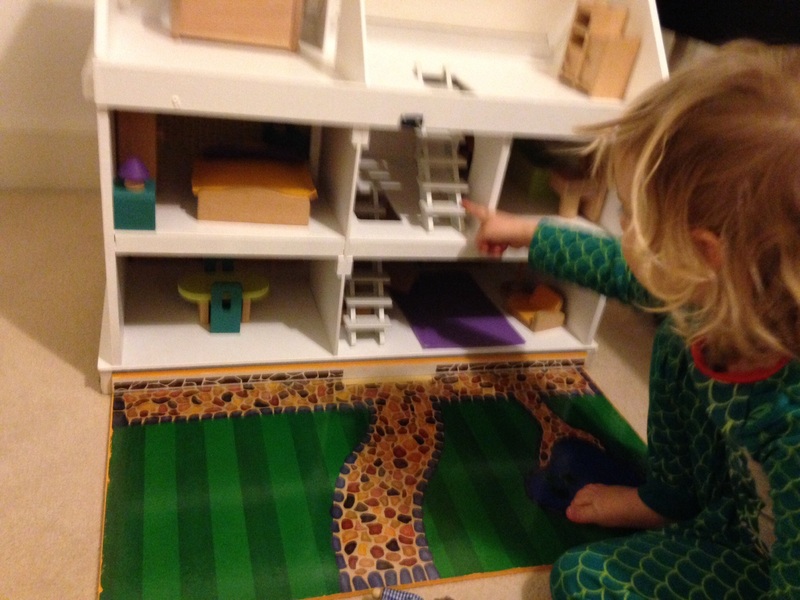 I should probably explain that on the rare occasion I take Squeak to playgroup, she makes a beeline for the large plastic dolls house. She doesn’t seem to mind that there are only two dolls, a bed a cot and two chairs, but she minds a lot when another two-year old toddles over to share it. 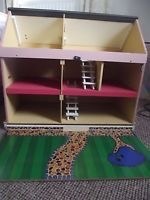 I decide that a dolls house would be a perfect birthday present and find only two problems with this. Firstly, they seem to cost a ridiculous amount of money. And then require you to spend more money on dolls and furniture. Secondly, they are all hideous. Huge, plastic and in three luminous shades of pink. And I look at the tasteful picture and utter the stupidest words possible: How hard could it be? 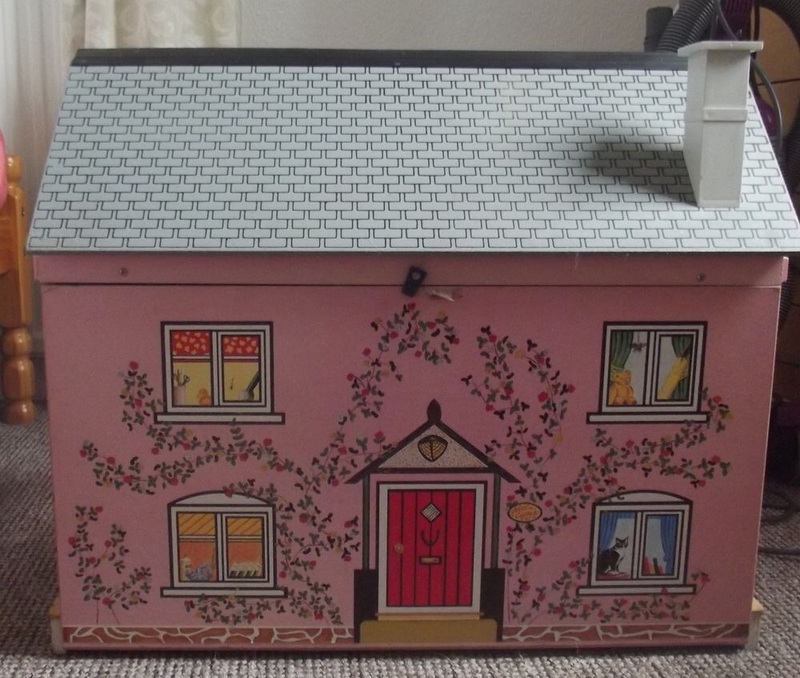 It arrived covered in the dirt and grime of years in the attic and I seriously worried about what I had let myself in for. But by this point I was in too deep. Areed with a mixed bag of wooden furniture and an unwise amount of determination I poured a bowl of soapy water and got to work. But it’s really not about me, is it? That’s where the guilt comes in. Or rather, not guilt, so much as a worry that my best might not be good enough. And then Squeak ripped the paper off with the biggest grin ever, and I decided that this time, my best was good enough. Quibble and Squeak are holding hands, dancing around in a circle, giggling. Suddenly, they break apart and begin to run from one end of the lounge to the other, one arm outstretched shouting, ‘Superman! Superman!’. Quibble announces that it is time for the Big Ending and they both fall to the ground, legs in the air, waiting for their applause. I blame myself. My love of Strictly Come Dancing predates both of my children. When the first series aired in 2004 I considered myself somewhat of an expert, having been a member of the Latin American and Ballroom Society at university. I tried to judge the celebrities fairly, as someone who understood a (dangerously) small amount of the technical aspects, but I usually just let myself get carried away by the beauty of the outfits and the magic of the dancing. This year, for the first time, Quibble is old enough to stay up on a Saturday night to watch the first few dances with me. I tell Stanchion that seeing the scores adding up improves Quibble’s numeracy skills, that the exposure to different styles of music and dancing aids his creativity and self-expression and that it is good for him to see people responding to feedback. And I do believe that, I do. All those things are important… but, well, really, I love seeing him love the same things I do. On Sunday morning, after breakfast, we sit with Squeak at the iPad to show her the best dances. There is commentary from Quibble (who has an excellent memory for the judge’s comments), while Squeak points out all the different bright colours, and, in between the dances, they demonstrate their own unique interpretations of what they have seen. I usually just let myself get carried away by the, ahem, beauty and magic of the moment. In twelve years of watching Strictly, I’ve never found anyone else who loves watching the dancing in the same way I do – except now I have. I’ve found two little people who like it so much they are currently attempting a mash up of a Waltz, the Superman Paso and what I can only assume is some sort of jazz ending.